LOS ANGELES—Members of the Armenian-American community gathered at the Azeri Consulate General in Los Angeles to protest and condemn the Sumgait Pogroms of 1988 and the 2004 axe murder of Armenian Lieutenant Gurgen Margaryan by Azeri soldier Ramil Safarov. 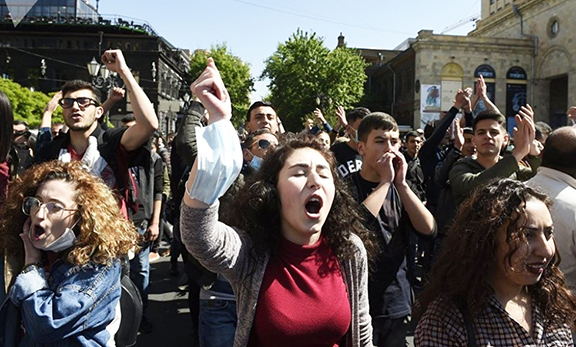 Organized by the Unified Young Armenians and attended by several community organizations, the rally aimed to inform the public and the international community about the horrors inflicted on Armenians by Azeris. Whether a pre-meditated and state-sponsored massacre of the entire Armenian population in Sumgait, or an individual’s act of vengeance that was subsequently glorified, Azerbaijan continues its anti-Armenian policies until today. Among the speakers at the rally was David Arakelyan who condemned the Azeri government for glorifying an axe murderer and for its role in committing the Sumgait pogroms, which led to more large-scale massacre of Armenians in Kirovabad, Baku, Shahumian, Getashen and Martounashen. Arakelyan also condemned the international community for its silence on these crimes, which emboldens Azerbaijan to continue its military aggression against Armenians in the Nagorno-Karabakh Republic and Armenia.